Everyone who knows me, knows I am full of beans. Did I get your attention? They are literally, falling out of my freezer, all the time. It's not unusual in my house to slide open the freezer door and see bags and bags of frozen beans. Whenever I am home for the day, I take advantage by putting on some beans to cook. A pot of cold water is all you need. After they're cooked, cool and drain into freezer bags and they are ready to go at any time. They are the perfect, healthy, side dish for steaks, chicken, even fish. Buon Appetito! Heat your olive oil in a skillet. I used cast iron but any flat skillet will do. Saute your garlic until fragrant. Add you tomatoes to the pan. With the back of a wooden spoon, smash your tomatoes some right into the pan. This should take about 3-5 minutes. I like to keep my garlic in the pan, as it is large enough pieces, to discard onto the side of your plate. Add your salt and mix. Slowly add your beans. Remember, your beans are precooked, so you are just adding flavor. At this point, they are done. I do like to Add 1/2 cup white wine and simmer away. Dry, white wine, brings out the sweetness of the tomatoes. Add a handful of parsley, mix and serve warm in a large bowl. They also travel well and are perfect for an outdoor picnic. 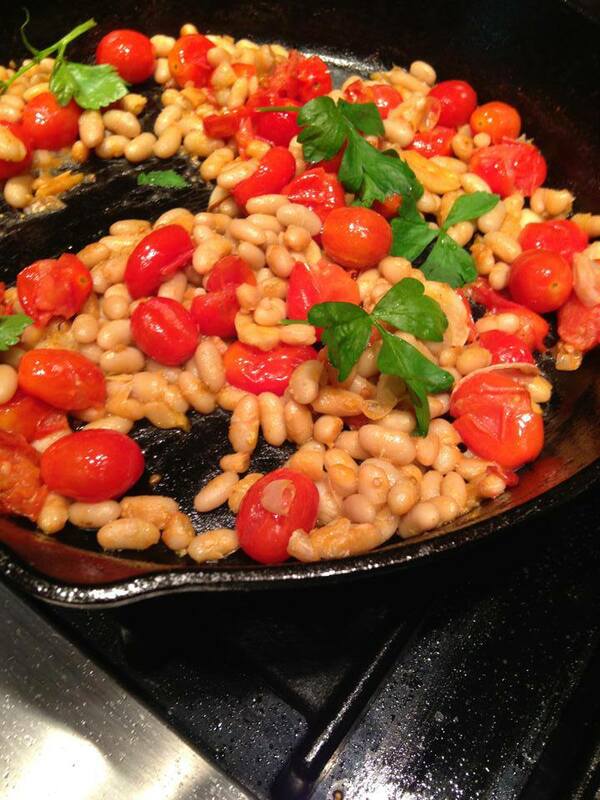 Anything with cannellini beans and you've got my attention...and with garlic and tomatoes...I'm in heaven! Thanks for a simple yet terrific recipe! I agree with Laney, this is the perfect combo and perfect summer recipe.